Best to correct out toe condition in kids as well as other foot conditions. All sandal in one as they truly orthopedic best sandals for a child. Sporty ortho support sandals, adorable and soft. Close on the back, great sandal for kid with profiled ortho soles. Corrective fix best girls sandals with good arches.Orthopedic high arch walking sandals for a child Orthopedic high arch walking sandals for a child Silver smooth leather with pink flower. They adjust so well on kids foot from 3 sides. Best o..
Ankle high tops sandals with best orthopedic arch support.Tall covering the ankles Well processed leather and padded color for comfort. Pink/white leather. Decorated with polka dots. Close on the back, great sandal for deformed feet. High arches.. Extra wide high top sandals for a new walker.High top ankle supportive purple sandals Purple and white polka dot leather. Sturdy heel for ankle support Preventive for ankles collapsing and pronationLittle feet are supported at all timesActi-fresh soles insid..
Out toe fix best kids sandals Closed back orthopedic support best kids sandals Flat feet best ankle supportive kids sandals Decorated with a flower. 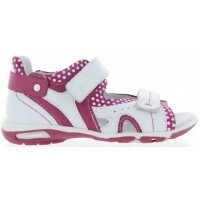 Fully adjust on child's foot.Proper ortho style - has it all arches, profiled soles and best leather u..